New Jersey riff-centric power trio THE ATOMIC BITCHWAX (aka TAB) has announced a North American headlining tour in support of its latest album, Gravitron. The tour will kick off on August 19 in Charlotte, NC and run through September 10 in Brooklyn, NY. 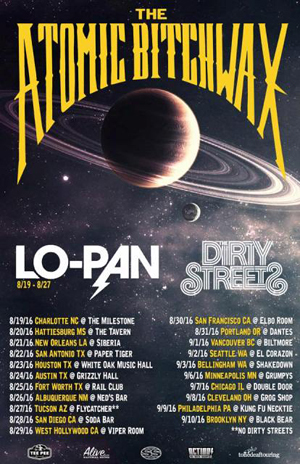 Joining THE ATOMIC BITCHWAX on the standout Summer trek will be LO-PAN and DIRTY STREETS. THE ATOMIC BITCHWAX's latest LP, Gravitron, was released in April 2015 via Tee Pee Records. Filled with gargantuan riffs and jaw-dropping psych sonics, the record has met to rave review. Gravitron is an A-level masterclass in badass rock n' roll and cements the THE ATOMIC BITCHWAX as an undeniable force in today's heavy music landscape. Since its formation in 1993, THE ATOMIC BITCHWAX has inspired hundreds of developing rock and metal bands, but no group of musicians has come close to matching TAB's unique style of fun, frenetic and formidable rock and roll. Featuring bassist/vocalist Chris Kosnik and drummer Bob Pantella (each also of MONSTER MAGNET) alongside shred-tastic gunslinger Finn Ryan, the band has perfected its unique style of NYC hard rock that High Times appropriately tabbed, "thunder-boogie".